The Center for Science in the Public Interest, a nonprofit public health advocacy group, is proposing changes in the way packaged food is labeled. The CSPI, with whom I’ve had some disagreements over the years (disparaging movie theatre popcorn and in 1994 calling fettuccine Alfredo “a heart attack on a plate“), nonetheless has played a prominent role in bringing issues of diet and nutrition to the forefront of the public consciousness in America. Their latest effort is around updating the nearly twenty-year old packaged food label. This label is designed to provide consumers with the information needed to make health-conscious choices while standing in the supermarket aisle. CSPI, though, says there are many changes needed to bring the labelling up-to-date and make it an easier tool with more relevant information. Here is a look at the before and after versions of the labels. Notice they remain the same size, so no additional space would be required on packages. You can click on the picture to see the full CSPI graphic about the labels. Calorie and serving size information is in much larger type at the top of the label. The ingredient list is much easier to read by printing it in regular type instead of all capital letters. Also, bullets separate ingredients rather than allowing them to all run together. Products containing more than 20 percent of the daily recommendation for fats, sugards, sodium and cholesterol would use red labeling and the word “high” placed next to the percentage. Easier to avoid foods that are high in these things. For items made of grains, the top of the lable would prominently display the percentage of whole grains contained in the product. What are your thoughts about these changes? I’m a firm believer that knowledge is power and that people are hungry (pardon the pun) for more and clearer information about the food they are consuming. Updated labels could help give people the information they need to make healthier, more helpful choices. A timeline of food and nutrition labeling. Full CSPI graphic of proposed changes and of the old and new versions of the label. Original NY Times article that inspired this entry. This entry was posted in Uncategorized and tagged CSPI, food, health, Labeling, Labels, Nutrition by christao408. Bookmark the permalink. So if the product is the same, how did the sugars and fiber content drop in the new label? It is easier to read but might take some getting used to… all change is hard even when it is good! The same things that jumped out at you jumped out at me here. I especially like the easier to read Ingredients section. I don’t know why they didn’t do this before. When I read it, my eyes glaze over. Perhaps that is the goal? I also like the new Allergy Information section. My ex-wife was allergic to peanuts and anything that had to do with peanuts, so I had to carefully review everything I purchased. This would make things much easier. @LostSock21 – Different standard probably. The proposed change most likely has adjusted the “daily value” for several things. But honestly though for those who care to read the label, they already do and the new changes although may make it easier for those people, it won’t matter to those that simply don’t care. 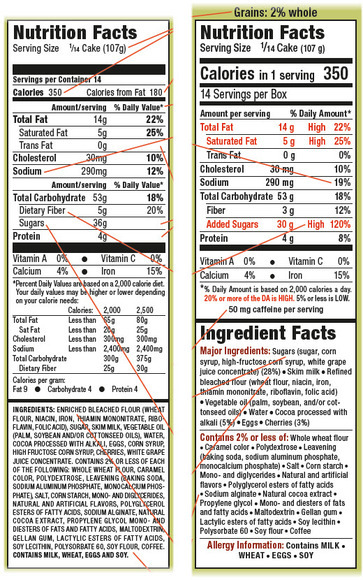 @LostSock21 – The full graphic of the label changes at this link offers these explanations for your questions:”Dietary fiber” should be called “Fiber” and should include only intact fiber from whole grains, beans, vegetables, fruit, and other foods. Polydextrose, maltodextrin, and similar carbohydrates should not count as fiber. 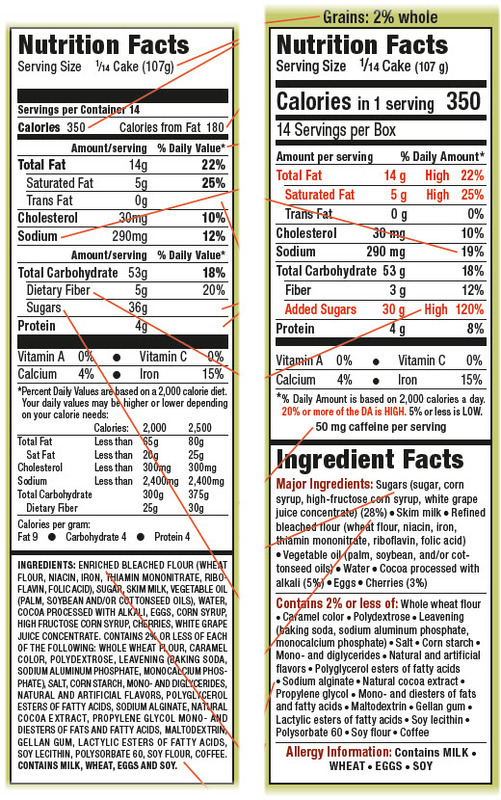 “The label should list only added sugars (from high-fructose corn syrup, table sugar, etc. ), not the naturally occurring sugars in milk and fruit. @arenadi – While I didn’t mention that, I had noticed the prominence of the allergens. Certainly very helpful in a day and age when an ever-increasing number of people have allergies. Considering your take on cooking and making cooking accessible to people, Mike, I’m not surprised you like the changes. @murisopsis – That’s very true, Val. An educational campaign would need to accompany the changes but what a great opportunity to educate folks. I like how they group sugars together and anything that makes it a bit easier to read is good. I know some companies break down the fibre to soluble and insoluble. The fact that they are prividing higher risk catrgories in a different ink, is a step in the right direction. I do think there are a lot of people who are honestly wanting to learn the real truth about these labels. @yang1815 – Well, I don’t completely agree. There are a lot of people for whom math and science are turn-offs. Reading something like the old label can be very overwhelming. The more you can make the information user-friendly, the more likely people are to use it. @ZSA_MD – Agreed. People want to make healthy decisions. Let’s give them the information to do it more easily. @ElusiveWords – The grouping of sugars and the removal of naturally-occurring sugars is a very important change. Personally, I think it’s misleading not to list naturally occuring sugars, as if they aren’t there? Isn’t that information still relevant to some folks such as diabetics? Otherwise, I like the design, and I’m sure I could figure out how to manual calc the naturally occuring sugars.I’m for the changes, so long as the politics of it doesn’t allow other non-desired changes to slip into whatever bill it takes to get these changes mandated – such as not labeling meat as from cloned animals or something like that. The design is user friendly but I don’t know how much difference it will make. @christao408 – But the only real additional information is “High” for the daily amounts and why they are high.The important information is already there for those who care to read it. I really don’t think there are that many people who would read it now simply because it’s in a bigger font.It is good that all the nutrients has a daily value attached to it. The designer for the new label gets props for me. This makes it so much easier to skim through and get the necessary info that I want. @yang1815 – Don’t you think that in the ingredient listing, putting “Sugars” as the first ingredient (because you’re combining all the added sugars into a single group) versus having “Wheat” as the first ingredient will be more effective at alerting people? Design influences use. @Rm2046 – Yes, I agree. Ease of use is very important. @Dezinerdreams – That is the real question, isn’t it? =)@iskrak – 5000% Ha ha! @everyday_yogi – It seems that both should be listed but I do see the value of listing added sugars separately. I think the biggest impact this will have is on the food manufacturers. When I go down the aisle at the grocery it’s very rare that I see anyone reading labels. I would like to see that change and I would be thrilled if most people started paying more attention, but I don’t think new labels are going to do that. It’s the red ink that is the setback for food manufacturers. I don’t think the media will allow products to contain outrageous amounts of fat and sugar, like in the example of 120% of a daily sugar intake. This will force manufacturers to revamp their lines in some cases…..will they come out with healthier changes? My suspicion is they will move towards new and heavier use of artificial and substitute fats, sugars and flavors, just to meet the numbers game. Food quality will suffer,…but 90% of America will not care.